A picture is worth a thousand tweets: more often than not, designing a good visual representation of our data, can help us make sense of them and highlight interesting insights. After collecting and analysing Twitter data, the tutorial continues with some notions on data visualisation with Python. but, at least in Python 3, the output is not a well formed HTML and you’d need to manually strip some characters. With this procedure, we can plot many different types of charts with Vincent. Let’s take a moment to browse the docs and see its capabilities. Another interesting aspect of analysing data from Twitter is the possibility to observe the distribution of tweets over time. In other words, if we organise the frequencies into temporal buckets, we could observe how Twitter users react to real-time events. One of my favourite tools for data analysis with Python is Pandas, which also has a fairly decent support for time series. 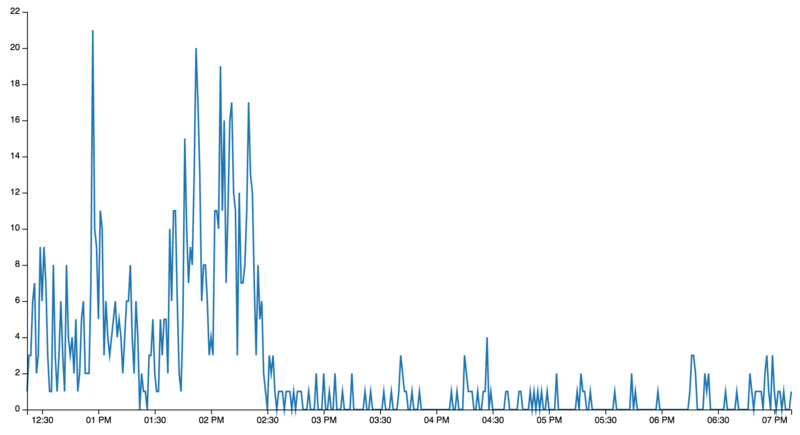 As an example, let’s track the hashtag #ITAvWAL to observe what happened during the first match. The last line is what allows us to track the frequencies over time. The series is re-sampled with intervals of 1 minute. This means all the tweets falling within a particular minute will be aggregated, more precisely they will be summed up, given how='sum'. The time index will not keep track of the seconds anymore. If there is no tweet in a particular minute, the fillna() function will fill the blanks with zeros. 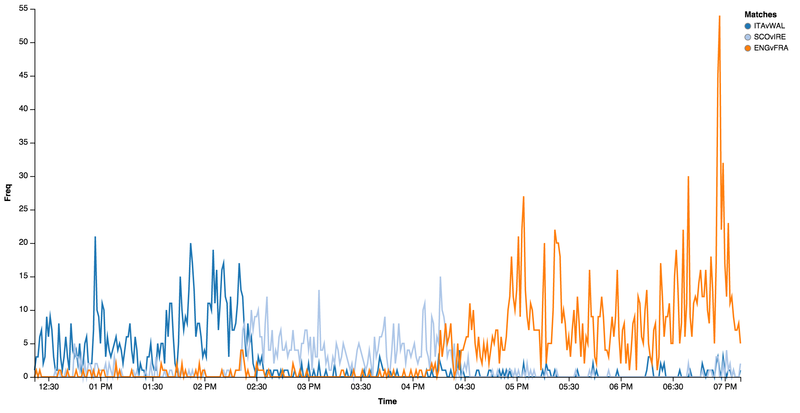 The interesting moments of the match are observable from the spikes in the series. 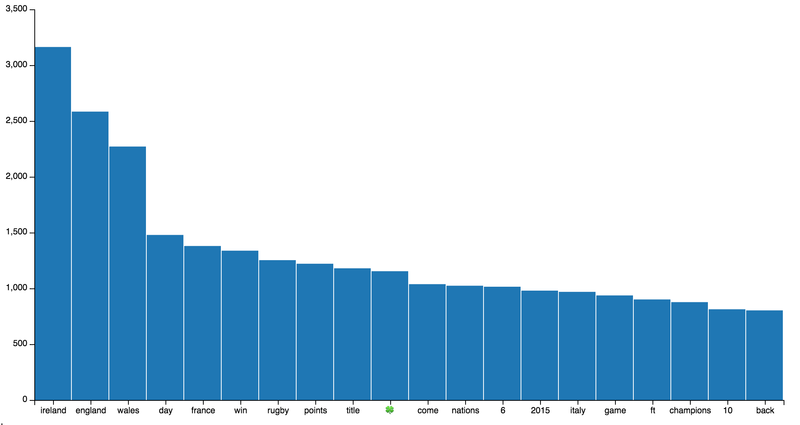 The first spike just before 1pm corresponds to the first Italian try. All the other spikes between 1:30 and 2:30pm correspond to Welsh tries and show the Welsh dominance during the second half. The match was over by 2:30, so after that Twitter went quiet. Rather than just observing one sequence at a time, we could compare different series to observe how the matches has evolved. So let’s refactor the code for the time series, keeping track of the three different hashtags #ITAvWAL, #SCOvIRE and #ENGvFRA into the corresponding pandas.Series. We can immediately observe when the different matches took place (approx 12:30-2:30, 2:30-4:30 and 5-7) and we can see how the last match had the all the attentions, especially in the end when the winner was revealed. If this article has given you some ideas for data visualisation, please leave a comment below or get in touch. I just get one line with the value 1. looks like the resample doesnt work..
every time a new “idx” shouldn’t it combine them for every minute? hallo, why i just got nothing on the webpage, could you tell me wether there are some important steps that i missed, thanks a lot! Kel3vra and anyone else having this issue – I had the same, running 2.7.11 on Windows bash of all things. Switched over to Python 3 and the issue was resolved. What are the “per_minute_i/s/e” values? how do you derive them? Never mind… figured it out… It was really a stupid question. lol! Hi, how can I use chart.html to display two charts at once? Why there is nothing showing on the html webpage? Can anyone help? There is an issue on Windows with the to_json function when saving the charts.html, the newline characters from the template are somehow switched to raw \n character, making the HTML format invalid and then the web browser can’t display it. I looked into it and it seems there is something wrong with the function resource_string inside pkg_resources module that vincent uses, I did not see how to fix it. In any case, replacing all the r’\n’ with ‘\r\n’ works.